As a member of the Petitions Committee, Catherine led a debate in Westminster Hall yesterday on the Government’s decision to close the childcare voucher scheme to all new entrants from April 2018, making the Tax Free Childcare scheme the only option available to families entering the system from that date. You can read Catherine’s speech below – and a transcript of the whole debate is available here. Alex Cunningham (Lab, Stockton North): I am pleased to have the opportunity to debate this issue. Does my hon. Friend recollect that when we were both on the Childcare Bill Committee, there was much discussion of the costs associated with provision for disabled children? It is therefore all the more important that we place on the record how tremendous the additional pressure is on parents in such circumstances. 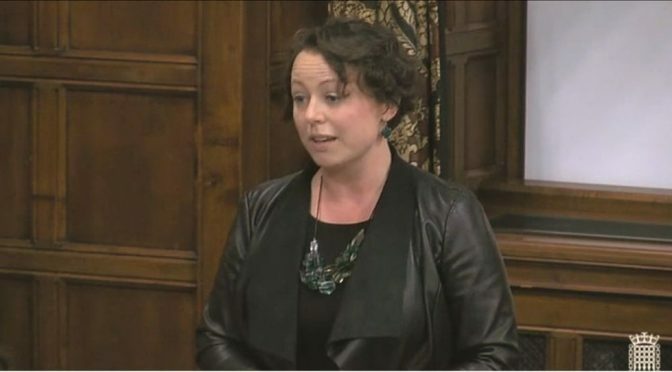 Catherine McKinnell: My hon. Friend is right. Some of the changes introduced by the Government have been positive in that regard, but far more still needs to ​be done to support families with disabled children. He is absolutely right to raise the issue so early in the debate, and I will return to it as we progress. It is critical, if we are to tackle increasing rates of child poverty and a lack of social mobility, that we address this issue. Increasing the availability of good-quality, affordable childcare clearly enables more parents to get into or return to work or access education and training, while also improving educational outcomes for their children. It is not just an issue for individual families; it is also of critical importance to our whole economy and our productivity levels. ‘Childcare is as vital as the rails and roads for helping our country to run’. There are a raft of early years and childcare-related concerns that I could touch on, starting with the cuts to Sure Start. Funding for Sure Start services has fallen by a staggering 46% since 2010 across the North East, which is my region. Parents were promised that 30 hours of free childcare would be in place for their three and four-year-olds by last September, but the Pre-School Learning Alliance recently reported that 18% of families registered for the scheme still cannot access that support. The long-term sustainability of the childcare sector is also at risk due to underfunding – more than 1,100 nurseries and childminders have gone out of business since 2015. However, this debate focuses on childcare vouchers and the new system of tax-free childcare, and whether one must replace the other, or indeed whether the two can co-exist. As hon. Members will be aware, the childcare voucher scheme was introduced in 2005 under the previous Labour Government, as part of the wider system of employer-supported childcare. Working parents signing up to the childcare voucher scheme agree to sacrifice up to £55 of their salary a week, or £243 a month, before tax and national insurance deductions, receiving in exchange vouchers that must be used to pay for Ofsted-registered childcare providers – nurseries, childminders, pre-schools, after-school clubs or holiday schemes – for children aged up to 15, or up to 16 for children with a disability. That equates to a maximum saving of £77.76 per ​month per parent for basic rate taxpayers, or £1,866 per year for a working couple who are both in receipt of childcare vouchers. The Childcare Voucher Providers Association calculates that some 780,000 parents are currently using vouchers, with millions of parents having received support since the scheme was introduced almost 13 years ago. According to a Library briefing paper, the Government state that more than 50,000 employers currently offer childcare vouchers to their staff, which the CVPA estimates equates to between 20 million and 26 million of the 31 million UK employees working for organisations that offer the scheme. Indeed, one of the benefits of childcare vouchers has been that employers have used their membership of the voucher scheme as an incentive to attract potential staff, which has helped organisations recognise the importance of childcare and family life for their workforce, often leading them to consider what more they can do to support the working parents they employ. The CVPA highlights that childcare vouchers are the second most popular company benefit; only workplace pensions, which employers must offer by law, are more popular. However, there are a number of well-documented flaws in the current childcare voucher scheme. A person’s ability to receive that support depends on their employer being registered for the scheme, which means that those whose employers are not registered cannot receive it. That includes the ever-increasing number of self-employed people in our economy, which the membership organisation IPSE estimates at around 4.8 million people in the UK. Rupa Huq (Lab, Ealing Central and Action): My hon. Friend mentioned lone parents. I wanted to flag the launch last week of a new all-party parliamentary group on single-parent families. There are all-party groups for every subject under the sun, but this is the first time that anyone has managed to create one on this subject. It is a fairly common form of family nowadays: according to figures from Gingerbread, more than 51% of families in some London seats are single-parent families. People talk about a benefits trap. Under tax-free childcare, some lower-paid single parents will automatically lose tax credits and universal credit. Does my hon. Friend not agree that the systems must be worked out better, so as to apply to all forms of family? Catherine McKinnell: My hon. Friend makes a crucial point and I will go on to highlight that key concern. She is right that we must focus on all types of families, not just the notional two-parent family that this childcare scheme seems to benefit most. As I have outlined, there are many downsides to the voucher scheme, which the Government cited to justify the introduction of the tax-free childcare alternative that was announced in March 2013. At that time, Ministers pledged that the new scheme would be phased ​in from autumn 2015 and that it would be available to families where all parents were in work and each earned less than £150,000 per year, as long as they were not in receipt of support for their childcare costs via tax credits or, when introduced, universal credit, as mentioned by my hon. Friend the Member for Ealing Central and Acton (Dr Huq). Such families would receive 20% of their annual childcare costs up to a fixed limit, which was set at £6,000 per child, so parents would receive a payment of up to £1,200 per child per year. Eventually, that would cover all children aged up to 12, or up to 17 for children with disabilities. As a consequence, Ministers confirmed to the House on 15 November that tax-free childcare would be rolled out for children aged six or under on 24 November. The assumption was that it would not be available to children aged 12 and under until the end of March 2018. That anticipated schedule has changed again, however: the Chief Secretary to the Treasury confirmed this morning – coincidentally – by written ministerial statement, that the scheme will be open to children aged nine and under from today and that all remaining eligible families will be able to access it from 14 February. If all that represents a simplification of the childcare support system, I would be interested to see how the Government could make it more complicated. ‘What do you get when you take one frazzled parent and sit them in front of an officious government website? Answer: confusion. Add technical glitches to the mix and that bewilderment quickly turns to anger and frustration… No matter what time of day or night I tried to sign up, things kept going wrong. Once I had found the correct web page I had multiple problems logging on. Crucially, the author highlighted that it is not possible to avoid those issues by signing up via post or over the phone; it must be done online. That leads me to ask the Minister: how many parents eligible to receive tax-free childcare will be prevented from receiving that support because they do not have easy, regular, and – crucially, given the type of data being provided – secure access to the internet? When I was a member of the Finance Bill Committee in 2014, alongside my hon. Friend the Member for Stockton North (Alex Cunningham), I asked the then Exchequer Secretary to the Treasury, the right hon. Member for Witham (Priti Patel), how many families would lose out as a result of that requirement. I received the answer that the Government estimated that as many as 9% of those eligible – up to 200,000 parents – did not have access to the internet, and therefore would be unable to receive tax-free childcare. Will the Minister set out whether that figure has changed and, if not, explain what the Government intend to do about it? Concerns around the tax-free childcare scheme are not restricted to its digital woes but include the inescapable fact that it provides the greatest benefits to families who can afford to spend the most on childcare, because it is effectively linked to parents’ expenditure rather than income. ​That could mean that some families, such as a lone parent of two disabled children with high childcare costs, receive more support than under vouchers, which I strongly welcome, or that a couple earning a joint income of £195,000 receive £2,000 towards the costs of their childcare. As the CVPA has pointed out, the way that tax-free childcare is structured means that it disproportionately favours wealthier families living in London and the south-east, who are more likely to have higher childcare costs and be higher earners. Tax-free childcare provides the same rate of saving on childcare costs irrespective of income – whether a family earns £240 per week or just under £200,000 per year. Ruth George (Lab, High Peak): I must declare an interest, as my husband and I both claimed childcare vouchers when our two children were young, after I had gone back to work and needed to support our children through childcare while on a very average wage. I certainly would not have been able to do that without childcare vouchers, and I know from working with retail workers in Tesco and the Co-op, who also have access to childcare vouchers, that they are in the same boat. Does my hon. Friend agree that in order to keep women in work it is very important to allow the voucher scheme to continue? Catherine McKinnell: My hon. Friend makes the point very well, because ordinary working families are more likely to be better off using childcare vouchers than using tax-free childcare. The vouchers are tapered, so that basic rate taxpayers save more than higher rate taxpayers, who in turn save more than additional rate taxpayers. Also, as we have already touched upon, lower-income families can benefit from accessing childcare vouchers alongside other forms of support for working families, including working tax credits and universal credit, while those using tax-free childcare cannot.